I always try to send my thank you cards out before the New Year, but that means making them before Christmas (a busy time) or crafting very simple ones. 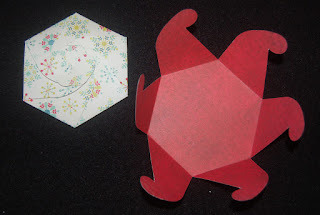 This year I purchased the Sizzix pop-up star die (the one that fits into the basic card die) from Ben Franklin Crafts. With these dies and some Martha Stewart and SN@P color vibe 12x12 cardstock papers., the bases for these cards were quickly made. 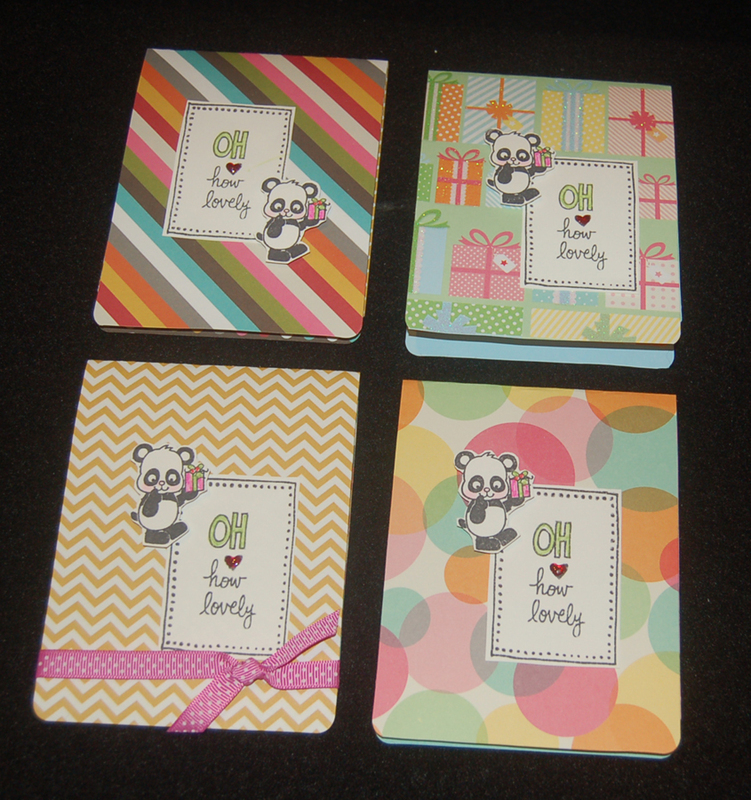 Using the Dandelion Designs panda stamp and the American Crafts Amy Tangerine word stamp, these cards were easily completed. Final touches included a stamped thank you and the addition of epoxy hearts. The inside of the card can be further enhanced by slipping a small photo behind the star cut out. Okay, I'm ready to write heartfelt thank you messages and pop these cards in the mail. 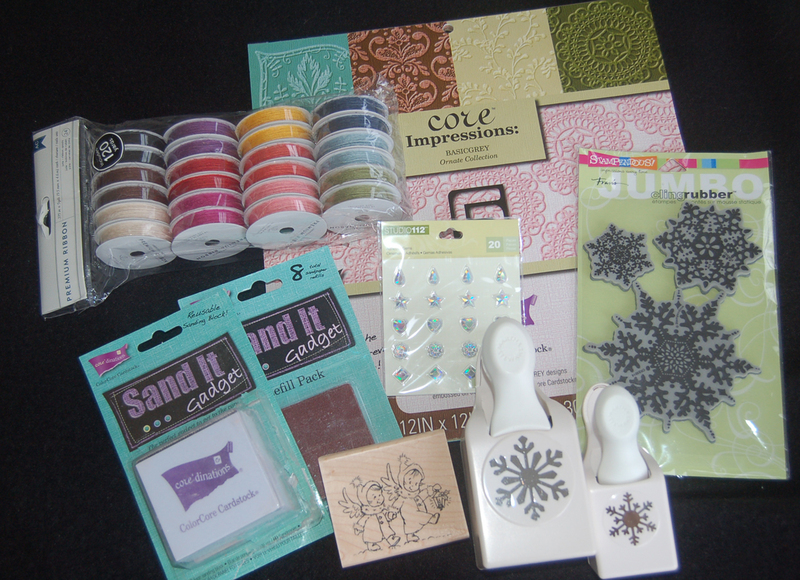 It feels great to wind up the year relatively stress-free thanks to the wonderful products I've found at Ben Franklin Crafts. I wish all of you a beautiful and crafty 2013. Hope I see you often in blogland! I had a vision of a soft and shimmery Christmas card but I didn't get around to creating it until today. Since it is too late to make copies to mail to friends and family, I decided that I would send one last card to everyone in blogland before Christmas Eve. Using watercolor paper, white embossing powder, Stampendous stamps and the technique I explained in my last blog post, I created the multicolored snowflake panel with silver embossed words. I recently discovered and purchased a pack of 12x12 embossed cardstock with a different colored inner core. When sanded with the Darice sanding block a pretty pattern was revealed (several different ones in the pack). This sanded pink piece (difficult to see in the photo) was layered with the piece of American Crafts glittered swirled cardstock. 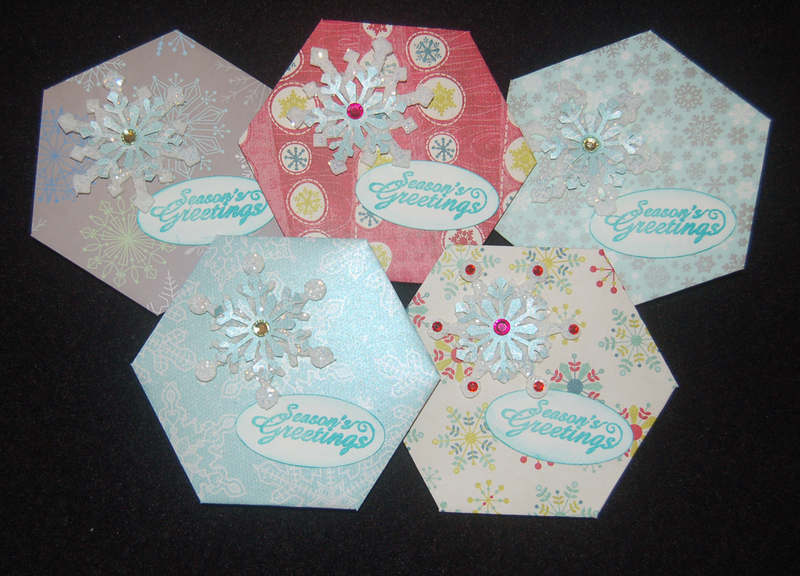 Punches were used for the circle (stamped with Stampendous image) and the two snowflakes (Martha Stewart). Added embellishments were blue twine from the jumbo pack (on sale at Ben Franklin Crafts), and Studio 112 sparkly stickers. 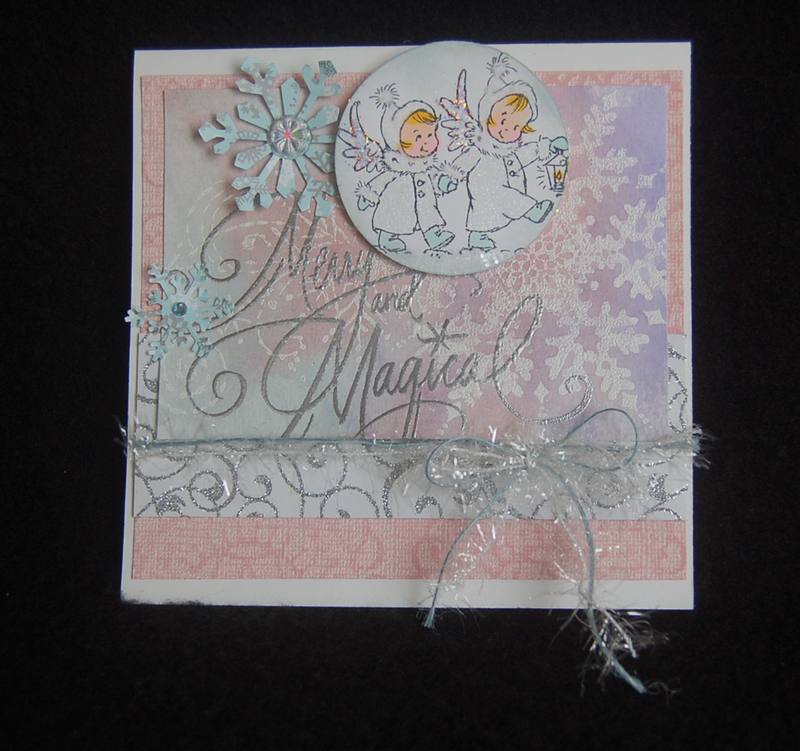 All the materials for this card were purchased from Ben Franklin Crafts. 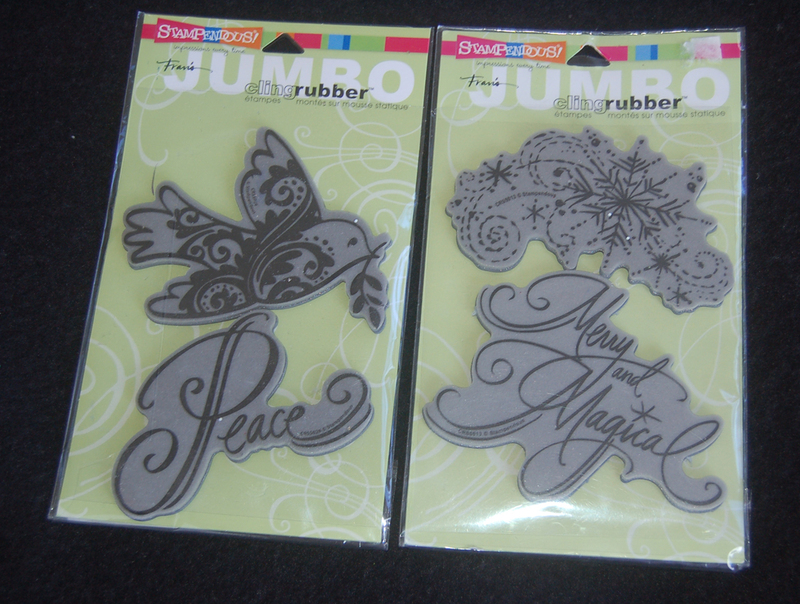 Before I put away my Christmas supplies, I might make a few more tags and put them aside for next year. Hopefully, I will be able to craft some thank you and New Year cards before the 1st, so I'll be off to a good start in 2013. I resolve to not procrastinate and craft seasonal items way in advance...... oh, and I resolve to clean up my craft room! Happy New Year to all my blogland friends! When you are short on time go BIG but don't lose the handmade touch. 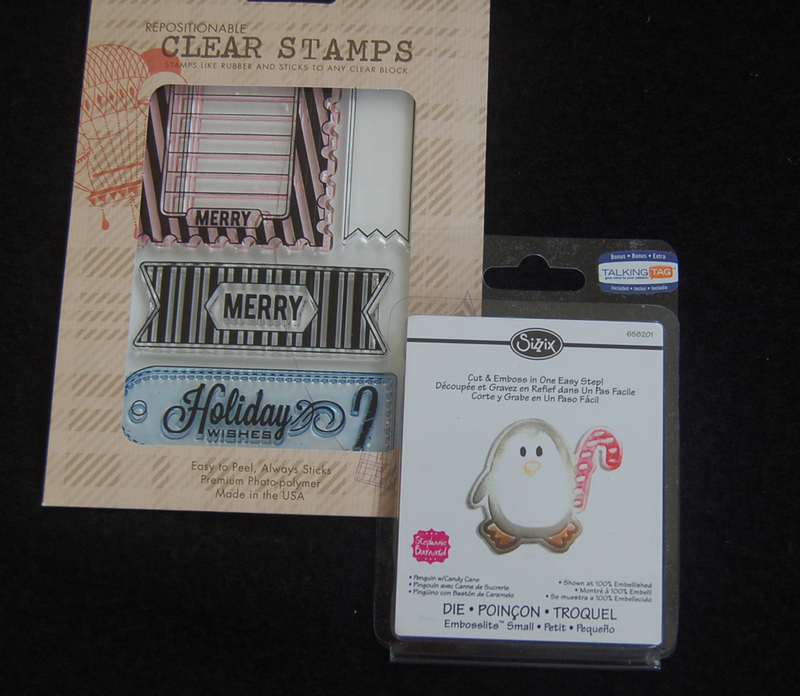 The Stampendous Jumbo cling rubber stamps I purchased from Ben Franklin Crafts are the perfect ones to use on a quick card project. I began by stamping the dove with white ink on white watercolor paper and heat embossing the wet ink with white opaque embossing powder. Next I sprayed the paper with water and applied three colors of stamping ink. I sprayed on more water and blotted the areas of the paper that were too dark. 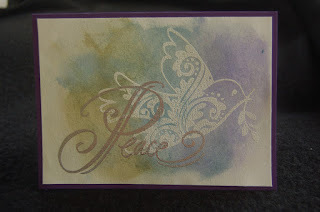 After heat drying the paper, I stamped the PEACE in silver ink and applied silver embossing powder melting it with the heat gun. The final step was using Merikan tape to adhere my faux watercolor design onto a purple 5x7 card. I love the simplicity and elegance of the finished card. I hope you'll try this technique on your future cards .Enjoy this season of giving! 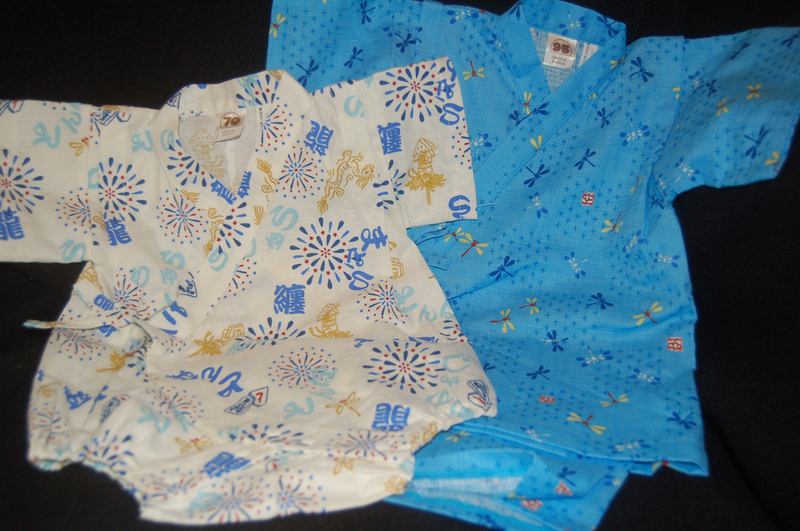 I purchased the cutest Japanese toddler clothes from our new Sanki store in Pearl City (near the Ben Franklin Crafts). Because the birthday gift was already late, I had to make a quickie card. I'm glad I remembered the Sister Stamp, 'Takeo' because it matched the gift and the occasion. After using Copic markers for coloring, Takeo's clothes were paper pieced with origami paper. The card base, and all embellishments were from the American Crafts birthday themed (hopefully still on sale at BFC) products. Maybe someday I'll actually make a file of finished cards to match any occasion so I won't feel so rushed during busy times like now. 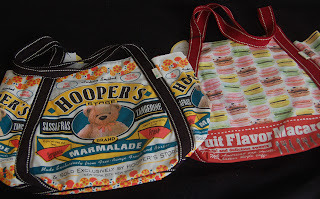 Have a enjoyable crafty week! Yes, I still have gifts to mail....gosh, where did the days go? 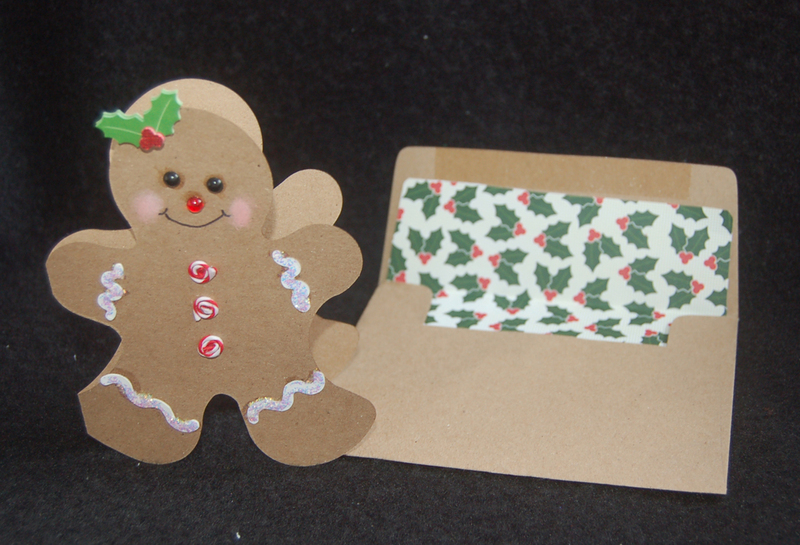 First, I decided that my small thinking-of-you gifts would have to be lightweight, flat, and mailable. I finished the gifts (can't show them to you because I want to surprise some of you who read this blog) and then had to decide what kind of matching card I should make. 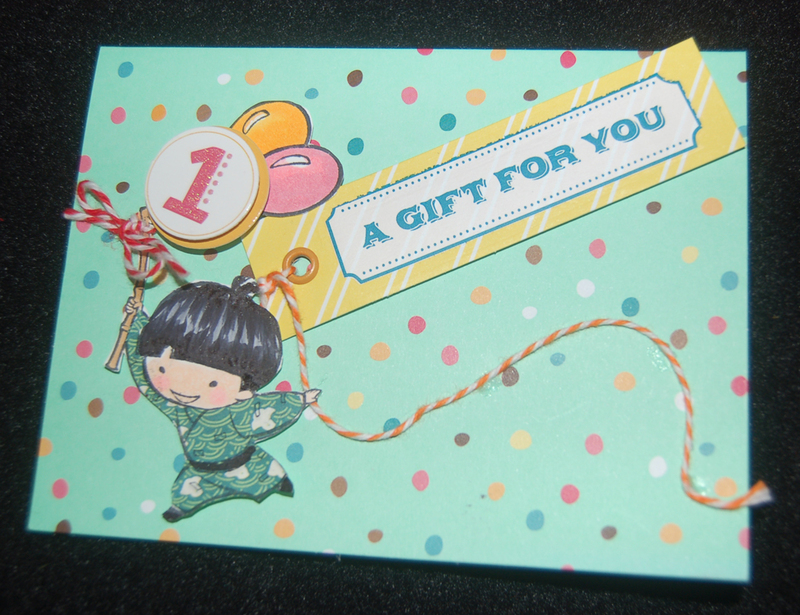 Because of the time crunch I had the brilliant idea to combine the card and gift package together. 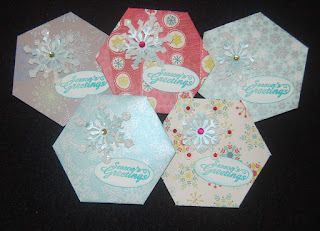 The snowflake gift holder made using the Sizzix CD holder die turned out to be super easy and effectively serves as both card and gift package. By die cutting the CD holder (no I'm not sending out a CD) out of assorted snowflake double-sided printed cardstock, everything was simplified and there wasn't much else to do but attach the snowflakes ( big ones cut from felt snowflake ribbon and glittered, and small ones made using a MS punch). Simple and done! Next I need to figure out some party favor packaging. Hope your holiday season is jolly and not too stressful. I enjoy making tags because they use up scraps without taking up too much crafting time. The cute penguin Sizzix die (purchased at Ben Franklin Crafts) not only embosses, it cuts out the penguin too which saves you lots of tedious work. I suppose you could chalk in the colors or use color core paper with a sanding technique, but I wanted a deeper color. By wrapping the tip of a bamboo skewer with a bit of paper towel, I was able to fashion a mini Q-tip. 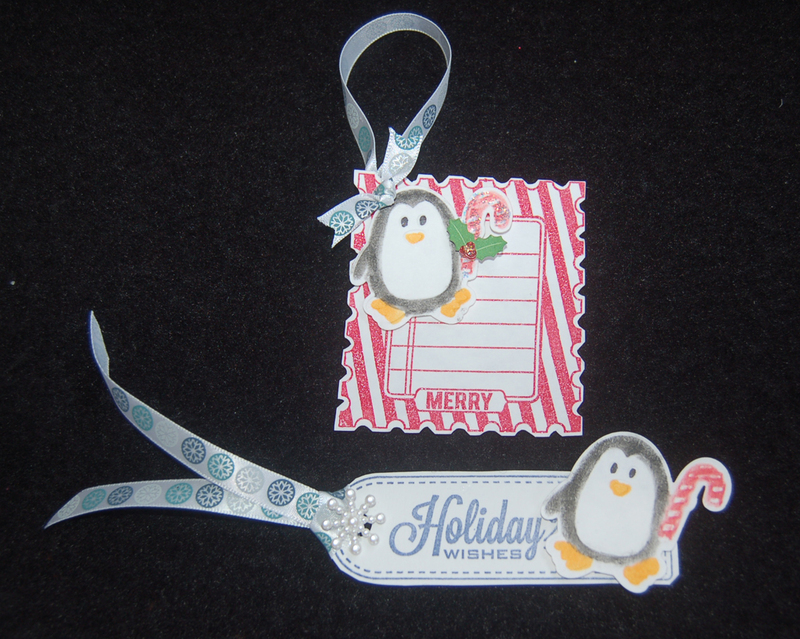 With this homemade tool I applied black and red ink on the embossed areas of the penguin body and candy cane. For the feet, eyes and beak I just used Copic marking pens. I discovered that the Hero Arts Clear Stamp (from BFC) set had eye-catching graphics and worked well for tag making. As you are beginning the holiday season, take the time to craft some tags with your children or grandchildren and make some lasting memories. Merry Memory Making! 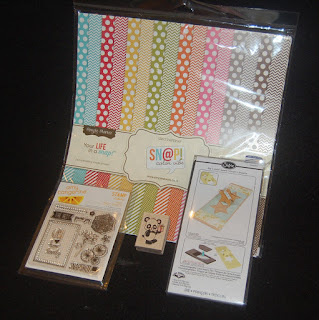 Here's another use for those Kraft Paper cards and envelopes (Sierra Pacific set). By placing the Sizzix Gingerbread man die (from Ben Franklin Crafts) just inside the crease of the card,, I was able to cut out a gingerbread man card with very little effort., The die also makes the squiggle frosting (cut these separately) pieces which were glued on. The eyes and nose are acrylic dots from the BFC floral department and the bow is a Martha Stewart sticker. The mouth was hand drawn and the cheeks were made with smudged pink ink. I found some red and white wire candy canes (Darice) in my stash and coiled them to form the buttons. 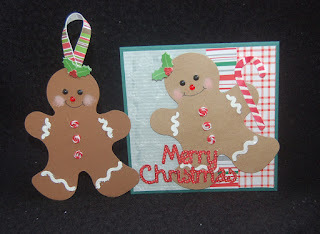 If you cannot find the wire candy canes small buttons or Fimo clay would work well on the gingerbread man. To brighten up the envelope I inserted some coordinating scrapbook paper. The tag in the second photo was made easily from a single piece of brown card stock. Teachers may find using this Sizzix die makes a great base for students to decorate a handmade ornament perhaps placing the child's photo in the place of the gingerbread face. For the second card I used the Sizzix gingerbread embossing folder on white parchment paper and combined it with paper strips from the paper pack (from BFC) in the bottom photo. The candy cane and words were easily cut from scraps using the bonus dies in the sets. 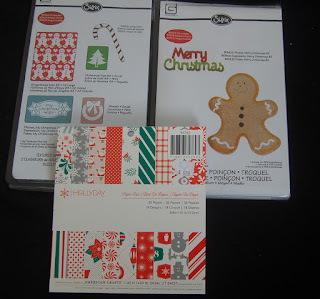 As an added bonus all of the Christmas Sizzix die and embossing sets come with a unique 'talking tag' which you can attach to your projects for an instant personal greeting for the recipient. Remember: 'Something handmade touches the heart and will dwell within it forever'. Yup, it's that time....time to award some prizes for my non-contest. For those of you who don't know what I'm talking about, let me give a brief explanation. Every once in awhile I decide to pick one of my followers and one comment giver to receive some Ben Franklin Craft gift cards. As usual I printed out all the comments left for me for the month and also the names of my 87 followers. I cut apart the comments and the names and put them in piles. That means if you gave me 10 comments for the month you would have 10 chances to win from the comment pile. This time I pulled out the two names from the two piles and was astounded by the winners' names. The winner of the comment pile is Cami whose blog is Capture a Heart. Some of you may remember that Cami was the winner of the follower prize last time. She told me that she never wins anything but I guess she should go buy some lottery tickets 'cuz she's on a lucky streak. I hope she'll be surprised and pleased to learn that she won the bigger of the two prizes (because it takes more effort to comment than to just be a follower). The second winner of the follower gift card prize is Regina (Expressions & Inspirations). (Yes, she does work for Ben Franklin Crafts but I believe that if it is a fair drawing that anyone should have a chance to win.) Of course, it must be evident that my drawings are truly random as I was totally surprised by the names I drew. Sorry for the length of this post but I wanted to make the non-contest information clear and send a cheerful congratulations to Cami and Regina! Are you looking for a unique place to buy gifts? The owners of the Hawaii Ben Franklin Crafts stores in partnership with another local investor and the Sanki corporation have opened a clothing and home goods store in the Pearl City shopping center (two doors down from the Pearl City Ben Franklin Crafts store). The first thing that most people comment on are the low prices for the good quality products. I couldn't decide which items to feature in this post; there are so many incredible products. 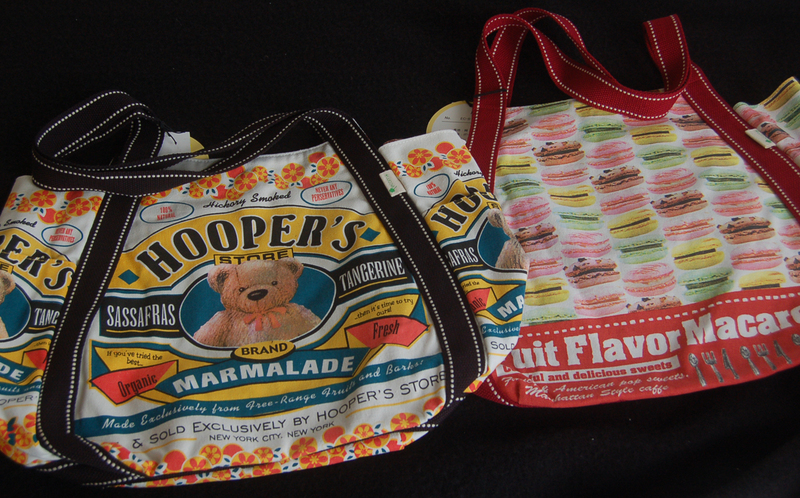 I really, really love the gigantic totes with the cutest graphic designs in the first photo. In the second photo are some cool towels for gym enthusiasts because they are long and thin but made of soft, fluffy towel fabric.....plus the designs are awesome. 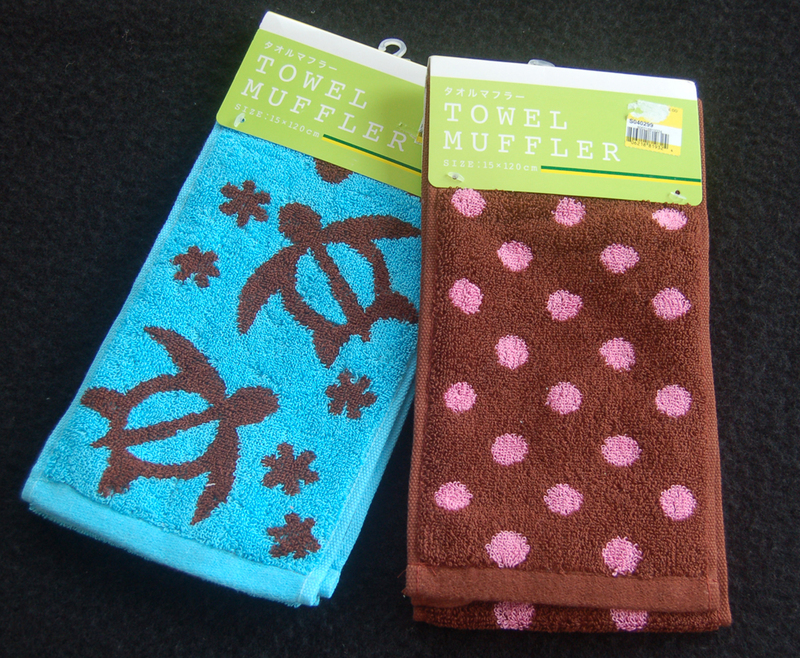 The Sanki store has a great selection of fabulous towels selling for a very reasonable cost. 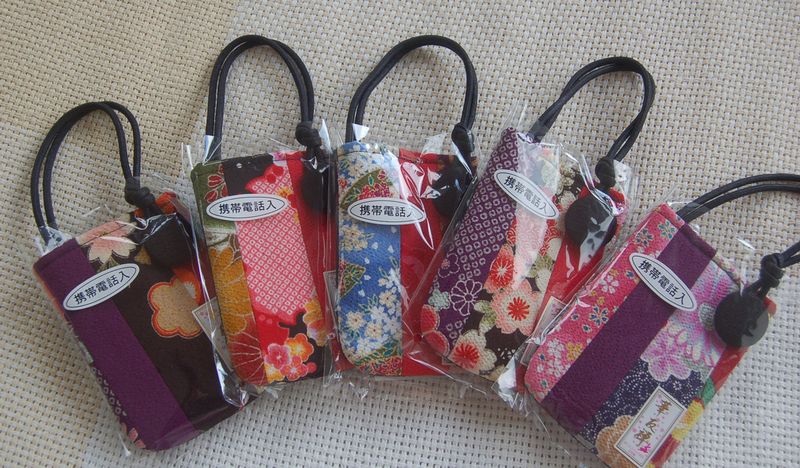 The final photo shows a few of the cell phone carriers (fits Iphones) that I purchased for Xmas gifts. Not only were they beautiful and well-made (can be attached to your purse), but they were one third the price of cell phone holders (identical style) that I bought in Japan (for gifts) just 6 months ago. Not shown here are some of the high quality priced-low underwear that I discovered at the Sanki store. You're going to love the camisoles, tank tops and knit short sleeve blouses with the built in bras. I hope that I've whetted your desire to check out the new Sanki store for your sure-to-delight Christmas gifts. Happy Christmas Shopping!